I have a fantastic giveaway for you guys today from Pediasure! Last week I shared about our hectic mornings with two kids and getting ready for school, I was concerned Madison wasn't getting enough to eat before heading off for a long day of learning so we started giving her Pediasure Sidekicks. Everyone is loving it! The giveaway will be open for TWO weeks - good luck and I can't wait to hear your Fridgeworthy Moments! By the end of the summer my daughter (age 2 1/2) was 100% (except at night) potty trained!!!! No more diaper changing!! WOO HOO!!! This summer my 2 1/2 year old learned her colors and numbers 1-10 in Spanish!!! It is so cute to hear her sing Red is rojo! My son finally learned how to pedal his bike! Let's see we had a big summer. My 2 1/2 year old finally stopped being afraid of the pool. He now swims around (with a life vest) all by himself and he will even jump in. It is so great to see his excitement! He also learned his colors and can count 1-10! to say I'm proud doesn't seem to cover it! Eating is something we really have to work on because anymore he doesn't seem to want food at all. Doctor say's not to worry but maybe I should try Pediasure just to put my mind at ease. My 8 year old developed more self confidence this summer since he practiced and practiced his batting for baseball and now he hits the ball every time he is up to bat! My 6 year old taught himself how to finally ride a bike with no training wheels. He can start, stop and maneuver through things without just running into them! My baby learned how to roll over , my 9 yr old learned how to ice skate and my 11 yr old learned how to shoot a bow! My 2 year old finished her first outdoor summer session of swimming lessons. We now love to blow bubbles and go under water! My 2 year old learned to use a scooter and explored the world of water balloons!! SPLASH!!!! Ryan spent a week at the beach for the first time in his 2 year old life. I figured he'd be afraid of the ocean, instead he was running into the waves like a maniac. Toddlers are fun! My 7 and 4 year old both took swim lessons (which were successful) and we had a wonderful beach vacation! getting along with their sibling for FTW! Each of my daughters has their own milestones this summer. My 5 year old learned to swim and to spell a few words and my 2 year old is potty trained and has learned to spell her name! My 7 and 4 year old took swim lessons (which were successful) and had a wonderful beach vacation! My daughter turned 2 this summer, so we did some fun celebrating! She also learned her ABC's! My 4 month old learned how to roll over! My 2 year old is turning out to be a natural gymnast! She's the hardest working kiddo in her class and it's such a great activity for her. She loves it! This summer we drove cross country and moved back to the South. My kids are city boys and the looks on their faces the first time they caught a lightening bug was priceless! Now they love country life. Our 18 month old stopped being so picky at mealtime!! WOO! My 6 year old learned to swim without floaties and my 10 year old started playing on a traveling baseball team! They both are very active and involved in activities. They are not the type of kids to be still and watch tv they are on the go 24/7!!!! Woops! Didn't read before I commented! 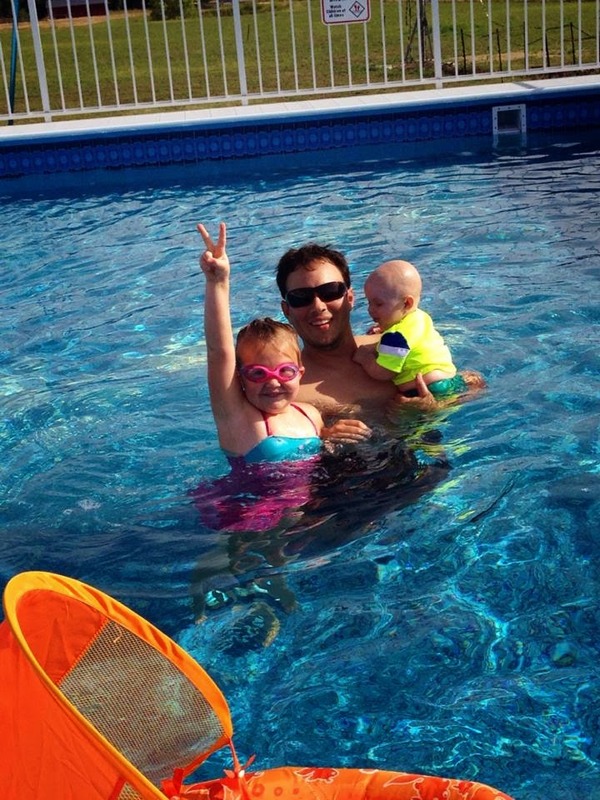 My 3 year old little guy's #fridgeworthy moment was learning to swim and float like a big boy! Our best fridgeworthy moment this summer was when our 1st and 2nd children met our 3rd child for the first time! It was love at first sight! My 2 year old and 3 year old would love these! My 2 1/2; year old is completely potty trained and can recite and recognize b the alphabet and numbers 1-20. Proud mommy. My 2 year old has started talking much more clearly with many more words!!! My 3 year old is now "trying" to read, but more like memorizing her favorite bedtime stories and it is so cute to hear her try. It's not my son, but it is my little cousin. This summer, at 2.5 years old, he finally started walking. He has been severely developmentally delayed since birth, but now he is finally running around like any other little boy with the help of braces on his ankles and legs! My kids ages 5 and 2 both went tubing for the first time. They loved it! My (almost) 4-year-old started running this summer & did a couple kid's races! She has more medals than mommy now ;-) My 1-year-old fell in love with swimming/the pool/everything water related. Wonderful summer! My 3 yr old decided she wanted to skateboard like her daddy so she got a skateboard helmet and pads and went down a small ramp with no fear! We love pedisure!! Our moment was this summer when my daughter who is 3 and has mild cerebral palsy started pulling herself up to a standing position! She has even tried to take a few steps! SO proud! What a great triumph for her - many more to come I'm sure! I loved seeing how much more my son loved the pool this summer! He was a little over a year and will jump off the sides! No fear with this boy (which terrifies mommy)! My six year old learned to swim on his on with out floats, my three year old is no longer afraid of being in pools. They had a great summer! My son drinks pediasure everyday all day! Over the summer our son rode fair rides for the first time and loved them! He is a little daredevil and rode rides with my husband that I wouldn't eve ride! So many frideworthy moments from this summer... My then 3 nearly 4 year old daughter declared she wanted to learn how to ride her bike without training wheels! (what?!!?!?) So proud of her initiative to learn! My 2 and a half year old son started telling us when he had to go potty, and actually went when we put him on there (I literally did a dance in excitement). My daughter started ballet lessons. Tears of cuteness ran down my cheeks seeing her in her leotard and bun for the first time. That should be illegal! We took our shy neighbor to church with us, and my daughter took her hand when she was nervous when the mom's left the classroom, and our little friend lasted the entire sermon without having her mom paged! Proud mama moment! My little man started riding a big kid bike with training wheels and learned he liked to jump into the pool with his floaties on but not holding on to our hands. Adorable! Such a good summer filled with memories! Are they free to come and teach Madison?? My 2.5 year old tested out of speech therapy! I'm so proud of his progress, especially after just a year of therapy! For the first time this summer we went to do orphan care work in Mexico as a family, usually it is just my husband or I who go but this time we got to take our 5 year old daughter. It was awesome seeing her interact with the child and the home we were at despite her language barrier with them. One day we took the kids to an amusement park, it was my daughter's first time going to one as well. Watching her and the girls ride rides together and seeing the joy and the excitement on their faces as they both experianced it for the first time was priceless! That is just amazing, what a great memory for all of you!! I've got a picky eater that is a snacker too! My 2.5 yr old moved to his big boy bed! Little kids are the cutest when playing soccer!! I love it! My son finally jumped off the diving board! We had an amazing summer going to a million parks! My 8 year old son was very accepting to the fact that I had to pull him out of summer camp because I wasn't able to afford it. D o he stayed at home with his cousin and everyday he did his packet of "school work" I had put together and completed his chores. He's pretty awesome! So this summer my 7 year old took her training wheels off. She has practiced, practiced, practiced! She couldnt be anymore excited about being a "big girl". My 5 year old son has grown up so much this past summer that I can't even keep up. The baby turns one in October so we've had a summer full of #fridgeworthymoments .Feeling very Blessed. Love summer! We had alot of fun going to zoo and parks with friends. Some of our fav things to do is to go to Muga and Grandpa's by the lake and fish, chase fireflies and make smores! We spent the summer preparing for a new baby! So exciting!! My middle daughter, she's 7. She is a Mutton Buster (rides sheep)! She's so brave! We went on the Mutton Busting circuit so to speak this summer and she rode at 6 different rodeos/events. It's a riot and she loves it so as long as she's confident enough to do it we let her go for it until she out grows it of course. For my children, it would also be swimming successes. However, I was so very proud to witness my son (age 3) when he stood up for his sister (age 5), and protected her during a situation where he feared that she would be hurt. Thanks for the chance to win. My Fridgeworthy moment would definitely have to be my 8, 6, and 3 year old niece and nephews all being in my wedding this summer. This all did so good walking down the aisle and smiling for all the pictures. My daughter rode her bike without training wheels for the first time....she figured it out without help!! Melted my heart! I was so proud!! We went camping this summer and it was the first for our three little guys and they loved it. They were ready to sell our house and just camp all the time! We had a fantastic trip to Orlando with my parents, my younger brother and his family. My daughter, Riley, was born June 17th and pretty much everything she has done is fridge worthy! haha New mom over here!!! My little man got over his fear of the water at the lake. My 4 yr old son learned to ride a two wheeler. His 6 yr old sister taught him while I made dinner one evening. Lol. My 9 yr old son learned to water ski. My 6 yr old son learned to ride a bike without training wheels. My niece learned how to take care of animals! My dad and stepmom have a very tiny farm. My niece, R, learned to take care of chickens and the frogs in the pond. She loves going to "Papa's" house to feed the chickens! My 6 year old went off the diving board for the very first time - she was hooked! Then my 2 year old enjoyed independence in the water courtesy of her puddle jumper & enjoyed swimming & kicking around. She even jumped off the side of the pool to me a few times by the end of the Summer! We took my 4 year old to Rocky Mountain National Park and we saw so many animals! He loved every bit of it and we got some great pictures! It was my daughter's first summer so everything was exciting! I have to try these with my son! We let my 22 year old niece take our 4 year old daughter to Kansas for the summer! My mother in law wanted our daughter to spend the summer with her like many grandchildren before and so we thought it was about time. We live in NM, so a trip to Kansas without your parents is a big deal! She loved it! She has so much fun with her Mamaw and papaw! She helped them in the garden, thy took her to work with them, they played with her outside, she went swimming in a real big pool for the first time. I think a few weeks each summer wth them will a new thing for us. They aren't getting any younger and they love taking care of her and spending time with her. They don't get to see her often, so it's a great thing! My son is the pickiest eater ever maybe this would help him get the nutrients he needs. Love your blog. Have a great day! My son riding his bike without training wheels. My son riding a bike and swimming in the pool and my other son getting to experience summer walking!! My ten year landed a solo on her dance competition team. Very proud mommy moment and after five four hour dance days a week all summer, some being closer to eight hour days, well deserved!!! Plus she did a profession dance camp which was AMAZING as well. My daughter turned 3 end of August we had a busy summer between going to the east coast to see family and going to Montana to see family. She is a great traveler car or plane I guess since she flew since she was 12 days old makes her that way. My favorit ething my niece and I did was take a beautiful hike! We took our son to the beach throughout the summer and that was fun! We live in San Antonio, TX and we love love love to visit Sea World as much as possible! Mine did a reading program where she read over 200 hours. I was so happy! Building a great treehouse has been the highlight of my kiddos' summer. We had such a memorable summer from learning to pedal a bike,to playing soccer for the first time, to swimming, and just having an all around good time! We ended the summer with my son starting his first year of preschool! Sad to see summer go but looking forward to the rest of the year!